Are you guys ready for our FIRST Filipino Kamayan Dinner! It’s happening Friday, June 5th, 2015 at the PAO Cafe (14837 N. Florida Ave., Tampa, FL 33613)! A Kamayan is a Filipino Feast served on banana leaves – patrons eat with their hands. Dinner will begin promptly at 6PM. The event is BYOB – so feel free to bring over your favorite Filipino beverage or another drink. Tickets are $45 in advance (plus tax) and available for purchase online! Hurry! Seating is limited at the event and ticket prices will increase at the door. We’ll finish off with Halo-Halo Supreme for Dessert! Happy Mother’s Day to all the Moms out there! We have something special for you on this special day! Tampa is home to one of the biggest Philippine festivals in the United States of America and PAO is happy to be a partner food vendor in this event. Each the year the festival attracts thousands of visitors. This year the Philippine Cultural Foundation celebrates the 20th year of the annual PhilFest from Friday, April 10th, 2015 to Sunday, April 12th, 2015 at the Bayanihan Cultural Complex. Discounted pre-sale tickets are available at the PAO Cafe! Come and buy your ticket today! PhilFest is sponsored by the City of Tampa, Hillsborough County Arts Council, Asia Trend Magazine, TFC: The Filipino Channel, One Philippines Florida Edition, and more. Chef Jonjie of the PAO Cafe and PAO Truck will be getting saucy at the 5th Annual Top Local Chef competition on Sunday, April 26th, 2015 from 5:00PM-7:00PM. Top Local Chef is Tampa Bay’s hottest competition, connecting the area’s foodies with the best restaurateurs and private chefs in the region. The event also features the Neighborhood Market, a specially selected collection of local vendors with unique locally sourced products. Top Local Chef supports local nonprofit: the Gulfport Historical Society. The Gulfport Historical Society operates the Gulfport Historical Museum, which houses the world’s most complete collection of information on the history of Gulfport, one of the oldest cities in Pinellas County. The museum, at 5301 28th Ave. S in Gulfport, features thousands of photographs and other records, archived with the support of city historian and local author Lynne Brown. Membership is available to individuals and families. For more information check out their website, gulfporthistoricalsociety.org. General admission includes tickets for samples from two of the competing chefs. Limited supplies of additional samples available for $5/each. Tickets are now on-sale for VIP and General Admission. Top Local Chef is produced by LocalShops1 and Intensity Academy Gourmet Sauces. For information on how you can be involved as a participating chef or event sponsor, email events@localshops1.com. As spring heats up in Tampa and we get back to this warm tropical weather, come cool off at the PAO Cafe with our Halo-Halo dessert! Halo-Halo is an a popular Filipino dessert with mixtures of shaved ice and evaporated milk to which are added various boiled sweet beans, jello and fruits. It literally means “mix-mix” because you mix your ingredients served to you to make the dessert. Halo-halo was featured as a Quickfire Challenge dish in the seventh episode of the 4th season of the American reality television series Top Chef. It was also featured in an episode of Anthony Bourdain: Parts Unknown, where Bourdain visits Jollibee, a popular Filipino fast-food chain. Enjoy a regular Halo-Halo for $7 which includes an iced mixture of various sweetened beans, jellies, fruits, ube halaya, house-made flan, and ice cream. 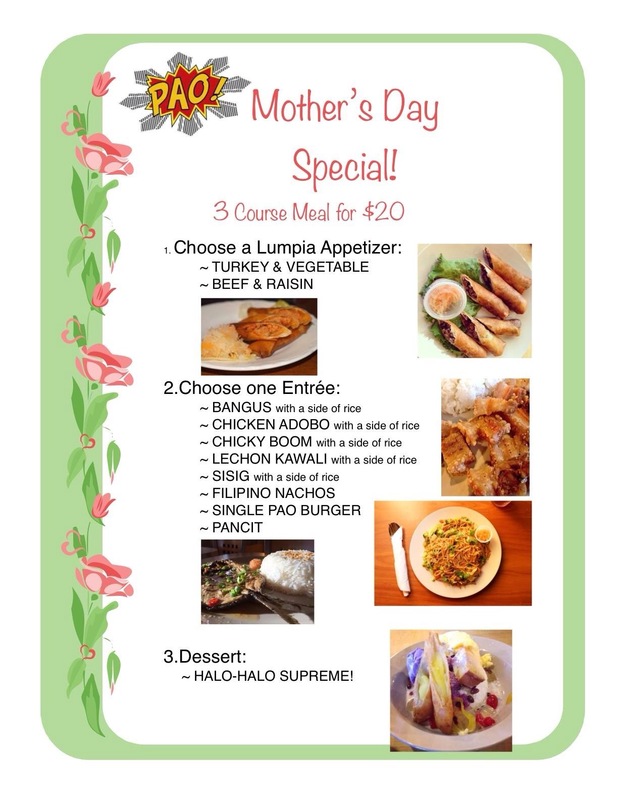 Order Halo-Halo Supreme for $3 more and add ube ice cream and turon! We will have a special for March Madness. Enjoy 50% off Halo-Halo Supreme Daily in March from 3PM-5PM! If you need catering for your event whether it is corporate or special events, we have you covered at the PAO Cafe. We have our Filipino food available in trays. In addition, if you have other needs for your event feel free to inquire and we can provide a wide-variety of cuisines. A half-tray serves 10-12 people with a full tray serving 20-25 people. Call 813-443-4855 to place your order or ask us questions. People familiar with our Filipino food truck, the PAO Truck, are aware that we are no stranger to Kickstarter and the challenges a campaign entails. Today we want to tell you about a great Kickstarter called Manileños, a film by the Filipino Street Art Project, that is hitting its deadline soon on Friday, November 7th, 2014 at 11:00PM. The goal of this campaign is to support Filipino street artists in return for original works from Manila, all while contributing to a social cause. The Kickstarter goal is $15,000 and is currently passing $11,700 as of November 2nd, 2014. Pledges can be as low as possible with a wide-variety of rewards available. The film is 75% complete and the $15,000 budget will support travel and completion of the film, post-production, Kickstarter fees/reward fulfillment, community engagement, festival fees, and a round of DVD duplication. If you cannot donate to their campaign, another way to help them is to share their Kickstarter campaign with your friends and family, any donation will help them get closer to their goal. Come down to PAO Cafe and celebrate Halloween with our Dinuguan special ($8.99). This dish featured cubes of pork in a tangy pork blood stew, a vampire favorite, and is served with white rice. This dish is also known as Filipino chocolate meat due to its chocolate-like color and consistency. Tracing the origin of Dinuguan in Filipino-cuisine is a task, but some stories claim that the tendency for Filipinos to waste no part of the food they eat (pig blood in this case) helped inspire the creation of Dinuguan as a dish in Philippine cuisine. The term Dinuguan comes from the Filipino word dugo meaning “blood”. Although often thought to be quite foreign, Dinuguan is not too different than European-style blood sausage or British black pudding with the main difference between vinegar and peppers. A similar dish is melas zomos (black soup) which is an ancient Spartan dish. Other names for Dinuguan include dinardaraan in Ilocano, tid-tad in Pampanga, dugo-dugo in Cebuano, sinugaok in Batangas, rugodugo in Waray, andsampayna or champayna in Northern Mindanao. PAO Cafe’s Spooky Halloween Extravaganza this FRIDAY! Come out to the PAO Cafe on Friday, October 24th, 2014 for a spooky extravaganza! We will be celebrating Halloween and have vendors as well as food trucks in front of the cafe with a spooky twist! Even better! We will have a photobooth and costume contest – wear your most unique Halloween attire and receive 10% off your order (if you come up with your own PAO costume you may even make it on our Facebook page ;D)! The lucky winner will win a free gift card to the PAO Cafe! The Escomo Truck will be serving their signature ice cream sandwiches so come out and get festive with them! NORTH TAMPA — Two years ago, chef Jonjie Sibayan launched the PAO food truck. His mission was to introduce authentic Filipino food to the people of Tampa. On Aug. 21, he took that mission one step further by opening his first brick-and-mortar restaurant, PAO Cafe, at 14837 N Florida Ave.
“With the food truck, space is limited. With the larger kitchen we can add more variety to the menu and expose more people to Filipino food,” said Johnny Sibayan, Jonjie’s younger brother and manager of the restaurant. The expanded menu features Filipino classics like tocilog (sweet marinated pork and garlic rice topped with a fried egg), pancit (stir fried mix of rice noodles and egg noodles with vegetables) and Lola’s lumpia (fried spring roll with beef and raisins). There are also crossover items, such as Boom Boom PAO (a cheeseburger topped with cured pork known as tocino and a fried egg) and Filipino nachos (tocino with spicy mayo and green onions served on shrimp chips). The staff is happy to help first-time customers navigate the menu. Followers of the food truck movement can rest assured the PAO Truck is still making its rounds. PAO Cafe is open 11 a.m. to 8 p.m. Tuesday through Sunday. It is closed on Monday. For more on PAO Cafe, visit paocafetampa.com. To find out where the PAO truck is headed next, follow it on Facebook: PAO Truck.